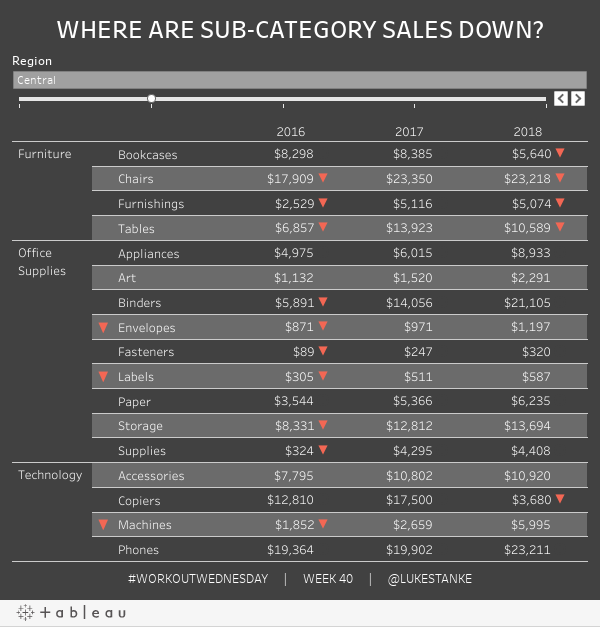 Week 40: Where are Sub-Category Sales Down? This week you are building something that looks like a text table. But there are a few twists, including the fact you cannot use text as a mark type. Use the shape mark type. Do not create a custom mark type that is transparent. Round sales to the nearest dollar. Make sure the values are right-aligned. Make sure to add banding that alternates from sub-category to sub-category. Place a red arrow down (▼) to the right of sub-category sales that are down compared to the year previous. Place a red arrow down (▼) in front of a sub-category label in the table if sales were lower in 2018 compared to sales in 2015. Show only order dates for 2016, 2017, and 2018 in the table. Be able to slice the data by Region. BONUS: embed a visual in the tooltip that shows yearly sales on a continuous axis and has a “▼” on the years where sales were down compared to the year previous. Sometimes small tricks can really work well..I learned using ‘Hide’ function for this scenario. Thanks for sharing!!! 1- instructions explicitly say not to use the text mark. But I see that Sales has been dropped in the text mark. (maybe I misunderstood the wording). I left Sales as a dimension to try and make it work while following the rules. 2-instructions say not to make mark transparent. But, workbook makes them the same color as the background, which is what I would consider making them transparent. Still, despite those hiccups, I would not have though of doing it quite like this, well done.